Here’s a GSM from 5 ha of vines located in the region of La Gardiole and Cabrières near Orange, in the northern part of Châteauneuf du Pape. The recipe on this wine is 95% Grenache with 2% Syrah, 2% Mourvèdre and a dash of white Bourboulenc. The vines, planted between 1910-1930, are grown on galet soils (little round, brown rocks), sand, clay and limestone. The rocks provide great drainage and also retain the day’s heat and re-radiate it to the vines during cool evenings. 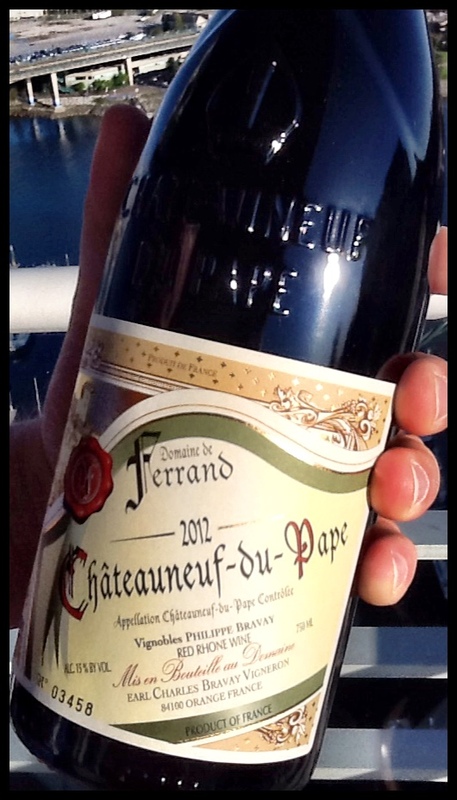 Philippe Bravay took over this vineyard from his father Charles in 1995 and that’s when the wines started being branded with the Ferrand name. Interestingly, absolutely no oak is harmed during the making of his wines – during either fermentation or ageing. He makes them as naturally as possible with little intervention. A pretty, translucent ruby red with delicate legs, this wine took some time to open up. The nose is a little hot with the alcohol (at 15% abv), but shows red fruit, field berry and sour cherry, eventually evolving to dried roses and garrigue. The palate is dry with medium acidity and the tannins are soft and not prominent. Flavours of deep rosemary and thyme with field berry gave way to bacon fat, leather glove and a sumptuous finish. I fear we opened this too early, although it was of course, enjoyable and complimented our dinner beautifully. WSET Very Good plus; cellar this graceful wine for 5-7 more. We enjoyed it with a gorgeous spring Table 1006 meal of organic steaks, fingerling potatoes baked in duck fat, truffle salt and tossed with parsley, fresh greens and grilled Fraser Valley asparagus. This entry was posted in Bourboulenc, France, Grenache / Garnacha, Mouvedre, Monastrell, RED, Shiraz / Syrah and tagged CdP, Charles Bravay Vignobles, Châteauneuf du Pape, cinsault, Domaine de Ferrand, france, grenache, mourvedre, Orange, Philippe Bravay Vignobles, red wine, syrah. Bookmark the permalink.